There are several approaches to myopia control management. How do we choose the best one for each patient? The increase in myopia prevalence has led to the development of new standards of care. There are two approaches to patient management in myopia control: reduce the risk of developing myopia or slow the progression of myopia. Patient education is an essential element of myopia control. The topic of myopia control has gained increased attention among clinicians over the past few years. Educating patients about myopia control options is now considered a standard of care due to the vision-threating conditions, economic burden, and public health concerns associated with myopia. The literature suggests that there are several effective modalities to prevent the onset of myopia and slow down its progression. This article provides information regarding current management strategies for myopia control and suggests ways to select the best approach for each patient. There are two approaches for management of myopia control. One approach is to reduce patients’ risk of developing myopia. Given that the prevalence of myopia can be as high as 84% in some Asian countries,1 finding ways to prevent the onset of myopia is important. Although little is known about this approach, researchers have explored the importance of time outdoors and the use of low-dose atropine. The long-term safety profile of low-dose atropine has not been established, but 1% atropine has a well-established safety profile for amblyopia treatment in children.20 Overall, atropine has been shown to be an effective mechanism for myopia control, and its use for this purpose should be examined by clinicians. The ideal myopia control patient is a young person first being diagnosed with myopia, as these individuals have the potential to progress more than older patients and can therefore benefit the most from myopia control.21 However, even if a patient is outside the ideal selection criteria, myopia control can be offered to any progressive myopes, provided that it is clearly communicated that they do not fit the typical profile in myopia control clinical studies. Given that all three treatments—orthokeratology, multifocal contact lenses, and low-dose atropine—have relatively equal efficacy,22,23 treatment can be recommended based on the patient’s age, lifestyle, and refractive error. Atropine is best for young patients, as the child’s guardian can administer one drop of atropine in each eye at bedtime. Contact lenses are a good option for more mature children with good motivation. Orthokeratology generally requires less maturity than soft multifocal contact lenses, as the orthokeratology lenses are worn only at home with the supervision of the guardian. Soft contact lenses require the child to be able to successfully manage the contact lenses during school hours. Once a treatment is selected, it is recommended to have the patient and guardian sign a consent form because all of the treatment options are off-label. Recommended safety measures include VA at distance and near, cover test at distance and near, accommodative amplitudes, pupil size, and anterior segment exam. Myopia management measurements should include axial length and refraction. Topography is recommended for treatment with multifocal lenses and is essential for orthokeratology. Patients should be monitored every 6 months to track refractive error and axial length. Additional follow-ups and testing may be indicated, depending on the selected contact lens modality. The increase in myopia prevalence has led to the development of new standards of care. Young, premyopic children should be advised to increase their time spent outdoors. Myopic children with an interest in myopia control should be advised to use either atropine, multifocal contact lenses, or orthokeratology. Patient education is an essential element of myopia management. Details should be discussed with the patient or guardian before the start of treatment. 1. Lin LL, Shih YF, Hsiao CK, Chen CJ. Prevalence of myopia in Taiwanese schoolchildren: 1983 to 2000. Ann Acad Med Singapore. 2004;33(1):27-33. 2. Xiong S, Sankaridurg P, Naduvilath T, et al. 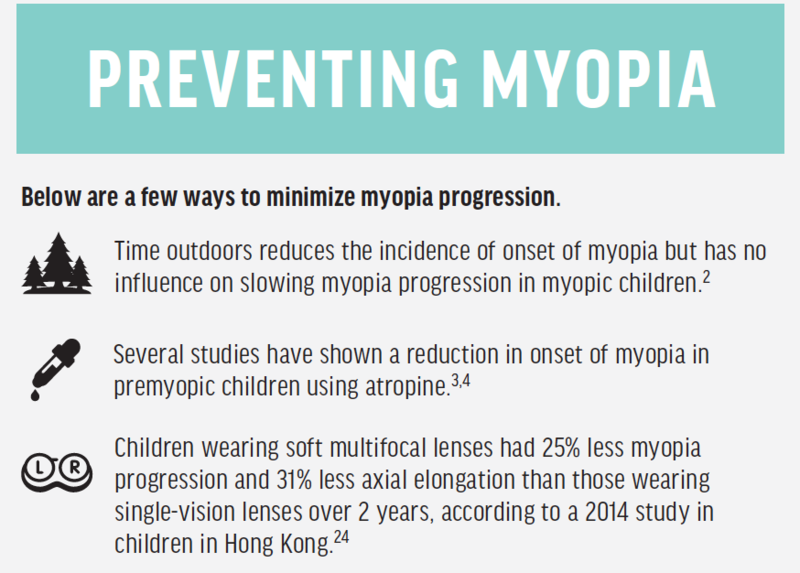 Time spent in outdoor activities in relation to myopia prevention and control: a meta-analysis and systematic review. Acta Ophthalmol. 2017;95(6):551-566. 3. Fang PC, Chung MY, Yu HJ, Wu PC. Prevention of myopia onset with 0.025% atropine in premyopic children. J Ocul Pharmacol Ther. 2010;26(4):341-345. 4. Lagreze WA, Schaeffel F. Preventing myopia. Dtsch Arztebl Int. 2017;114(35-36):575-580. 5. The Use of Atropine 0.01% in the Prevention and Control of Myopia (ATOM3). Clinicaltrials.gov. ClinicalTrials.gov/show/NCT03140358. Accessed February 14, 2019. 6. Aller T, Wildsoet C. Optical control of myopia has come of age: or has it? Optom Vis Sci. 2013;90(5):e135-137. 7. Cho P, Cheung SW, Edwards M. The longitudinal orthokeratology research in children (LORIC) in Hong Kong: a pilot study on refractive changes and myopic control. Curr Eye Res. 2005;30(1):71-80. 8. Walline JJ, Jones LA, Sinnott LT. Corneal reshaping and myopia progression. Br J Ophthalmol. 2009;93(9):1181-1185. 9. Walline JJ, Greiner KL, McVey ME, Jones-Jordan LA. Multifocal contact lens myopia control. Optom Vis Sci. 2013;90(11):1207-1214. 10. Anstice NS, Phillips JR. Effect of dual-focus soft contact lens wear on axial myopia progression in children. Ophthalmology. 2011;118(6):1152-1161. 11. Chia A, Chua WH, Cheung YB, et al. Atropine for the treatment of childhood myopia: safety and efficacy of 0.5%, 0.1%, and 0.01% doses (atropine for the treatment of myopia 2). Ophthalmology. 2012;119(2):347-354. 12. Chia A, Chua WH, Wen L, Fong A, Goon YY, Tan D. Atropine for the treatment of childhood myopia: changes after stopping atropine 0.01%, 0.1% and 0.5%. Am J Ophthalmol. 2014;157(2):451-457. 13. Chia A, Lu QS, Tan D. Five-year clinical trial on atropine for the treatment of myopia 2: myopia control with atropine 0.01% eyedrops. Ophthalmology. 2016;123(2):391-399. 14. Smith EL 3rd, Hung LF, Huang J. Relative peripheral hyperopic defocus alters central refractive development in infant monkeys. Vision Res. 2009;49(19):2386-2392. 15. Wagner H, Richdale K, Mitchell GL, et al. Age, behavior, environment, and health factors in the soft contact lens risk survey. Optom Vis Sci. 2014;91(3):252-261. 16. Walline JJ. Myopia control: A review. Eye Contact Lens. 2016;42(1):3-8. 17. Stapleton F, Keay L, Edwards K, Holden B. The epidemiology of microbial keratitis with silicone hydrogel contact lenses. Eye Contact Lens. 2013;39(1):79-85. 18. Gong CR, Troilo D, Richdale K. Accommodation and phoria in children wearing multifocal contact lenses. Optom Vis Sci. 2017;94(3):353-360. 19. Yam JC, Jiang Y, Tang SM, et al. Low-concentration atropine for myopia progression (LAMP) study: a randomized, double-blinded, placebo-controlled trial of 0.05%, 0.025%, and 0.01% atropine eye drops in myopia control. Ophthalmology. 2019;126(1):113-124. 20. Li T, Shotton K. Conventional occlusion versus pharmacologic penalization for amblyopia. Cochrane Database Syst Rev. 2009(4):CD006460. 21. COMET Group. Myopia stabilization and associated factors among participants in the correction of myopia evaluation trial (COMET). Invest Ophthalmol Vis Sci. 2013;54(13):7871-7884. 22. Smith MJ, Walline JJ. Controlling myopia progression in children and adolescents. Adolesc Health Med Ther. 2015;6:133-140. 23. Cooper J, O’Connor B, Watanabe R, et al. Case series analysis of myopic progression control with a unique extended depth of focus multifocal contact lens. Eye Contact Lens. 2018;44(5):e16-e24. 24. Lam CS, Tang WC, Tse DY, et al. Defocus Incorporated Soft Contact (DISC) Lens Slows Myopia Progression in Hong Kong Chinese Schoolchildren: A 2-year Randomised Clinical Trial. Br J Ophthalmol. 2014;98:40-45. 25. Rah MJ, Walline JJ, Jones-Jordan LA, et al. Vision specific quality of life of pediatric contact lens wearers. Optom Vis Sci. 2010;87(8):560-566. 26. Kinoshita N, Konno Y, Hamada N, Kanda Y, Shimmura-Tomita M, Kakehashi A. Additive effects of orthokeratology and atropine 0.01% ophthalmic solution in slowing axial elongation in children with myopia: first year results. Jpn J Ophthalmol. 2018;62(5):544-553.